For the folk music band, see Sol Invictus (band). Coin of Emperor Probus, circa 280, with Sol Invictus riding a quadriga, with legend SOLI INVICTO, "to the Unconquered Sun". Note how the Emperor (on the left) wears a radiated solar crown, worn also by the god (to the right). Sol Invictus ("the Unconquered Sun") or, more fully, Deus Sol Invictus ("the Unconquered Sun God") was a religious title applied to at least three distinct deities during the later Roman Empire: El Gabal, Mithras, and Sol. The earlier cult of Sol Indiges ("the native sun" or "the invoked sun") was agrarian. The title Deus Sol Invictus was formed similar to the imperial titulature pius felix invictus ("dutiful, fortunate, unconquered"). The Romans held a festival on December 25 called Dies Natalis Solis Invicti, "the birthday of the unconquered sun." 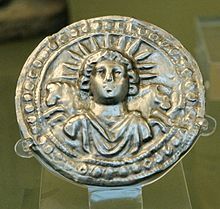 The use of the title Sol Invictus allowed several solar deities to be worshipped together, including Elah-Gabal, a Syrian sun god; Sol, the patron god of Emperor Aurelian (AD 270-274); and Mithras, a soldiers' god of Persian origin. Emperor Elagabalus (218-222) introduced the festival, and it reached the height of its popularity under Aurelian, who promoted it as an empire-wide holiday that was a possible inspiration of Christmas. ↑ "Sol Invictus and Christmas". penelope.uchicago.edu. Retrieved 2017-12-24. This page was last changed on 24 December 2017, at 01:39.